Inking It Up With Cathy: Thank You Lyssa!!! Back in the fall of 2008 (wow, was it really that long ago?) and just before my mastectomy, I was given a "Necessities Bag" from an organization who puts the bags together for women undergoing mastectomies. The bags included all kinds of items necessary during your hospital stay and the days after the surgery. I so appreciated everything that was given to me but noticed that there were no "thank you" cards for the gifts and flowers I received. Now, being a cardmaker myself, it was no problem. However, those women who are not cardmakers might need some so I decided to give back to the breast cancer community by donating thank you cards for inclusion in the bags. I then put out a post on Splitcoaststampers to other demonstrators and got several responses. Three wonderful ladies all sent me cards for donation. 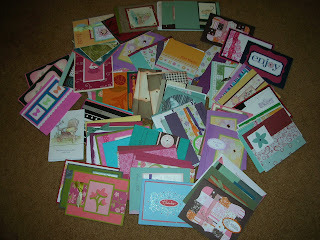 I just received this shipment from Lyssa - can you believe how many cards she and her customers sent to me!!! Thank you so much Lyssa! If you are interested in donating cards to this cause, please just let me know! I accept full cards or just card fronts which I will turn into full cards.